Will is one of the most joyous babies, and I’m not the only one that thinks so. 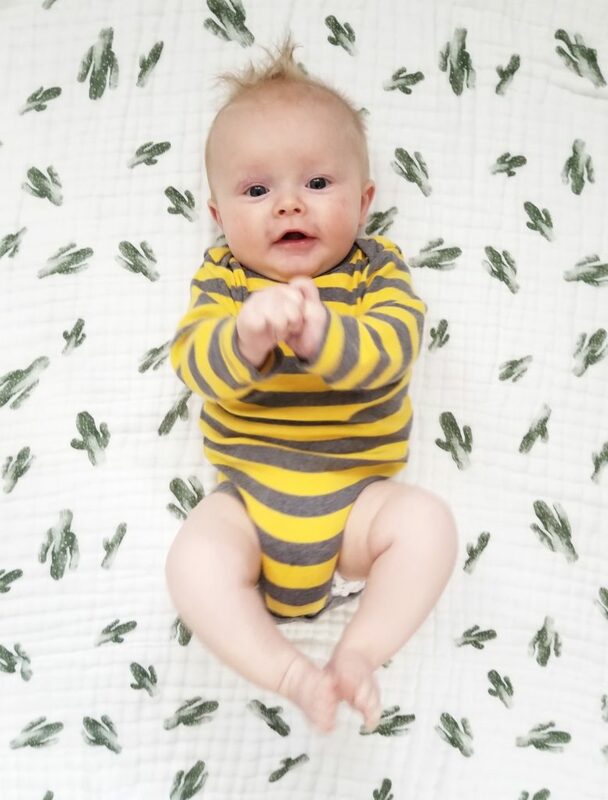 He hardly has any fussy times, is rarely cranky for no reason, and as long as we feed him and give him naps when he needs them he rewards us with smiles, laughs, and pterodactyl-like squawks that are just the most funny. Beck was really chatty as a baby, tons of random syllables and consonants, and Will is just the same. His best times are right after a nap/eating, he’s happy to sit in a bouncer or play on the floor with us, and is so funny and loud. There’s a mirror on the bottom of his baby gym that he will stare into for a little longer than is normal, so not sure about some vanity issues that might be blooming. A lot of people say that their second children are “super chill” or some variation thereof, and I’m not sure what that’s about. Maybe by our second we are calmer so the babies follow suit? Maybe we don’t jump to their every need as quickly so they learn some independence earlier? I’m sure there’s no science behind it, but I have a general feeling of calmness about Will that I didn’t have with Beck, so I guess it stands to reason that his personality might reflect that? I have no clue. He was covered in his own vomit, to be fair. He almost always is, and it doesn’t seem to bother him one bit, so we go with it. Will nurses about every two hours during the day and still spits up a good bit, but at his last pediatrician appointment his weight percentile had dropped a little so I’m feeding him slightly more than I had been. We swear he looks huge just in the last three weeks, so I’m hopeful he had a big spurt this last month and there will be no worries. Our doctor wasn’t worried about it at all since he’s hitting all of his milestones and isn’t fussy/seeming hungry, so fingers crossed that he’s right and THANK GOODNESS for a chill doctor to match my chill baby. Physical milestones are always so much fun to witness, and it’s been a month of allllmost growth on a few things. Will tolerates lots more tummy time and can reach for toys in front of him with an incredible amount of determination. 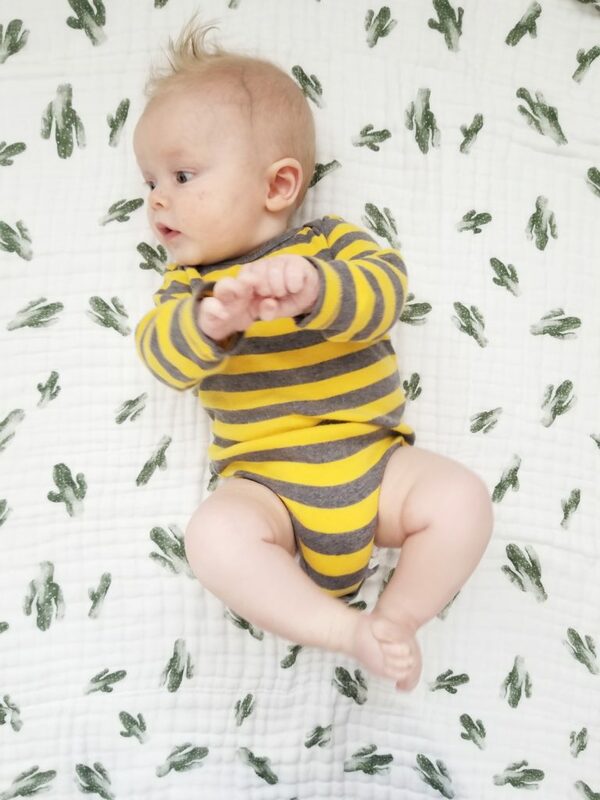 He’s been able to roll front-to-back for awhile and is working on flipping himself over from his back. 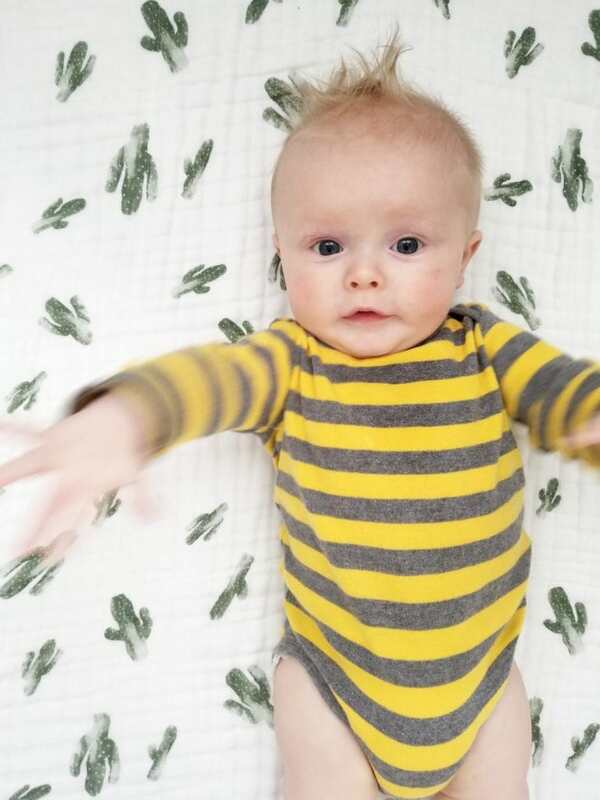 He’s at that funny stage where he’s somehow moving without crawling or rolling because he’s just so wiggly. 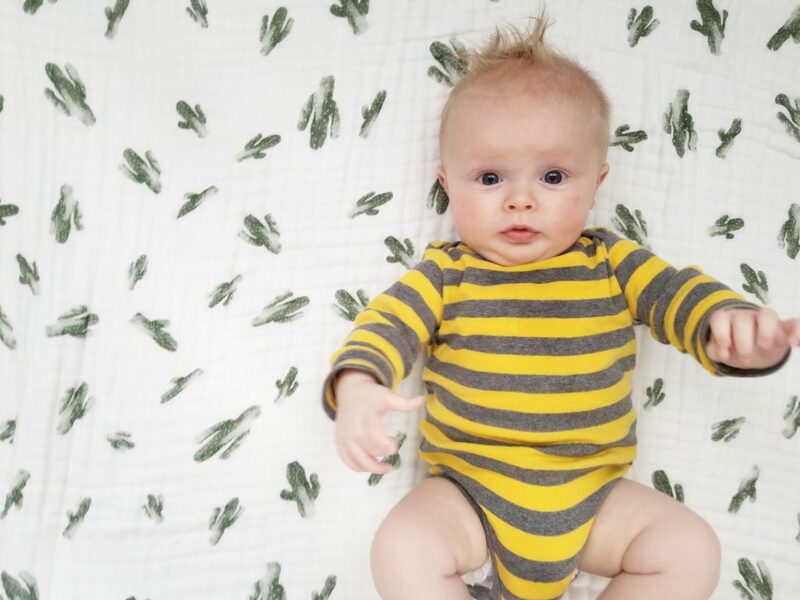 He LOVES being propped up in a seated position so we’ve started propping him up on pillows and I’m going to get out a little support chair for him that we have soon – Beck loved it in that in between time right before she could sit up on her own. I’ve been looking for boy/girl differences really hard, but honestly so far I don’t think there are any between my kids. 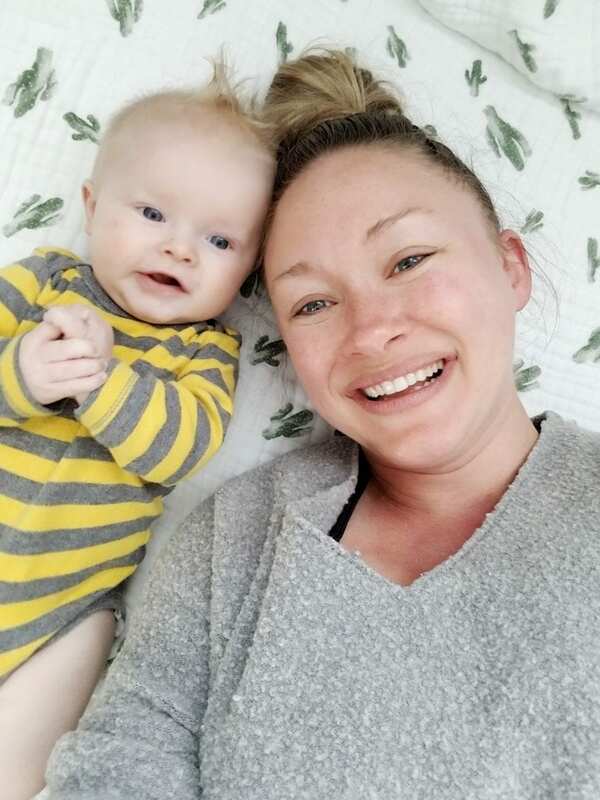 They both hit milestones right on target, and Beck was on the later side for some bigger physical stuff like crawling and walking, early on verbal things, so we’ll see if that’s the same or different as the months tick on. She also got teeth SUPER late, which was fabulous for nursing, but Will has recently started gnawing on his fist and drooling a ton, so I’m bracing myself for early teeth. Fingers crossed he’s just gnawing for kicks. Sleep is still going well, Will takes two or three naps per day depending on our schedule and will be awake anywhere from 90 minutes to three hours. I have a feeling that in a month or so he’ll go solidly to just two naps, but three is great when it happens for the sake of my productivity. 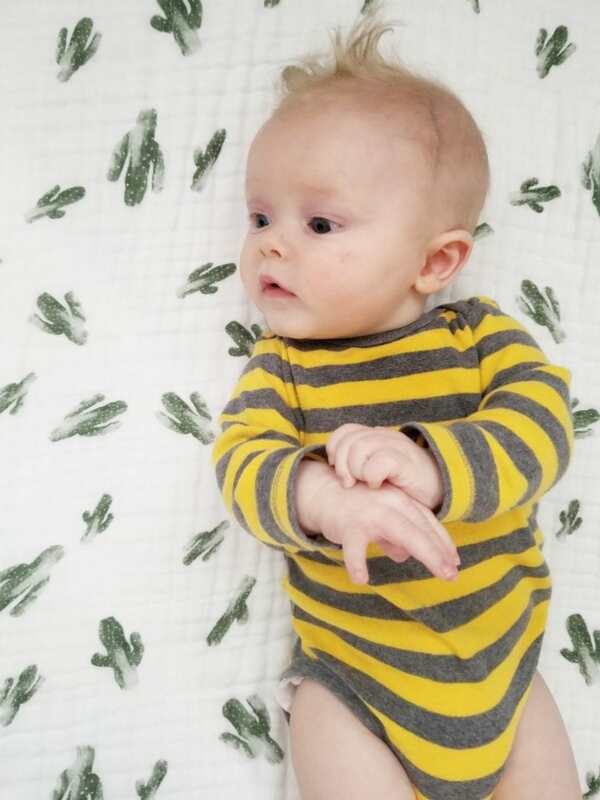 He sleeps swaddled in the Dockatot which we have in his crib, and out of three naps and bedtime per day he MAYBE fusses for one of them, and even then it’s never more than ten minutes. He’s not one to fall asleep in our arms ever, but will sit fairly nicely if he’s being held, and sometimes is so pitiful and tired if we’re out late somewhere or something like that. 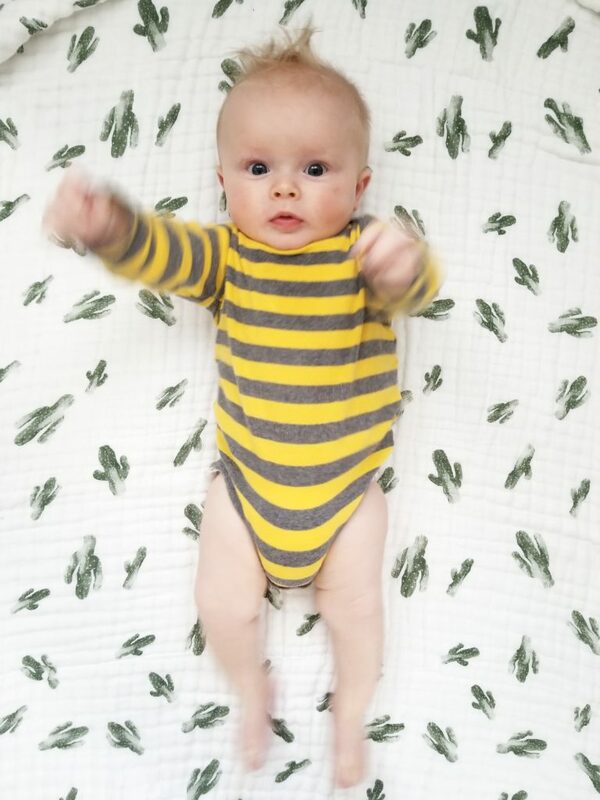 On nights like that he is positively RELIEVED to be swaddled and put to bed, just staring up at me with his arms in his little baby straightjacket, it’s the funniest thing and I’m grateful that he’s a relatively easy sleeper. Because of his weight I still nurse him once or twice per night, just whenever he wakes up. I’d love for him to drop one or two of those feedings, but am happy to see him an extra time or two for as long as is needed. I’m trying so hard to not wish any of these things away since this is likely our last baby, and how nuts that we spend, you know, our entire lives trying to not get pregnant, and then we do, and then it’s done in the blink of an eye, whether you have one kid or five. Even with some of the less pleasant parenting tasks I try to remember that when I find myself “can’t wait”-ing certain things away. These are the golden baby months, to me. 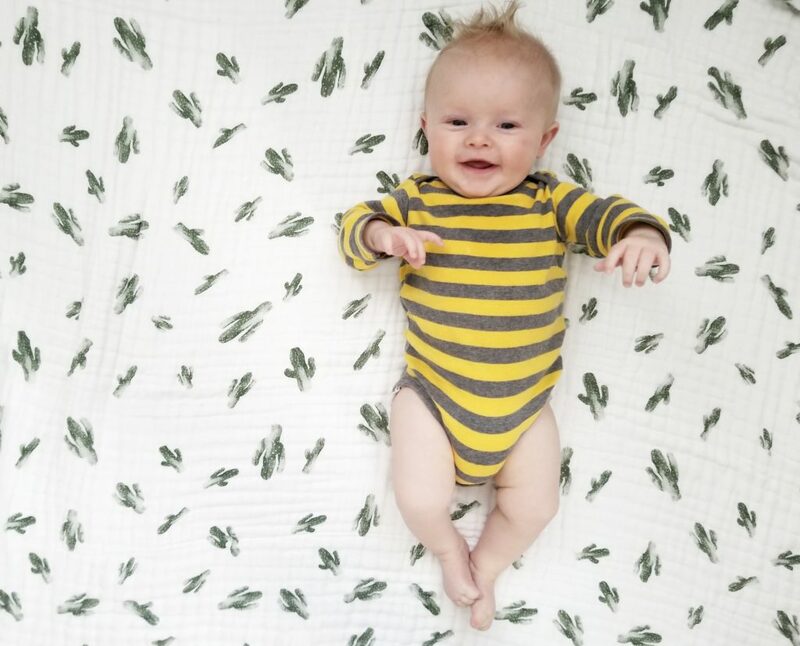 Smiling at his favorite people, which just happens to be us, content to bounce and play alone for enough time that I’m slightly productive, and incredibly joyous to watch grow.